This Aquasana Whole House Water Filtration System supplies clean, great-tasting water to every faucet in your home, cabin, townhouse or condominium without requiring electricity, drainage or back-flushing. Rated for up to 1,135,623L of treatment, the system is NSF-certified to remove over 97% of chlorine present in tap water in addition to reducing other harmful contaminants such as pesticides, herbicides, rust, sediment, water-soluble metals and industrial solvents. In addition to improving the purity of your drinking, bathing and laundry water, it also reduces the harmful impacts of contaminated tap water on appliances and plumbing fixtures. This Glacier Bay refrigerator system installs directly to the external water line so it fits all major brands of refrigerators and ice-makers providing great tasting water and cleaner, clearer ice. Adapts easily to boats, RVs, campers and motor homes. It is NSF certified and reduces sediment, turbidity, chlorine taste and odour, cysts, lead, lindane and atrazine. The first 6-month filter (HCGREF5) is included with system purchase. When changing the filter on this system, there is no need to shutoff water supply allowing for an easy no mess filter change. The ideal water filter system includes a sediment filter as the first stage to remove the larger particles of dirt or sediment before they can reach and clog your finer filters and appliances. The WSP-Series aims to fill this role by offering the stainless steel mesh in various micron sizes, allowing you to control what size particles are allowed to pass into your home or following filters. This helps prevent large particles of dirt from clogging any finer filters you may already have in place. The WSP also includes a powerful anti-scale and corrosion agent called siliphos. Siliphos is a water treatment compound, a glass-like Polyphosphate containing Sodium, Calcium Magnesium and Silicate, formulated specifically for the treatment of water problems. The 1-inch outlet MNPT fitting provides a maximum 20 GPM flow rate, and the WSP-Series also features 3/4 inch NPT threads on the inlet and outlet. The housing is manufactured with FDA approved grade materials. 55-Watt Ultra Violet Whole House Water Filter in Stainless Steel Housing. UV Lamp rated for 30 mj/cm2 at end of lamp life (9,000 hrs), single lamp per vessel, 3/4 inch MNPT, 110-Volt. UV light is capable of killing bacteria, viruses, and other microorganisms by interfering with the DNA and RNA in the organisms reproductive cycles. ISPRING UV Systems are ideal for a wide range of applications, including whole-house water disinfection, pretreatment for water treatment equipment and reverse osmosis systems. 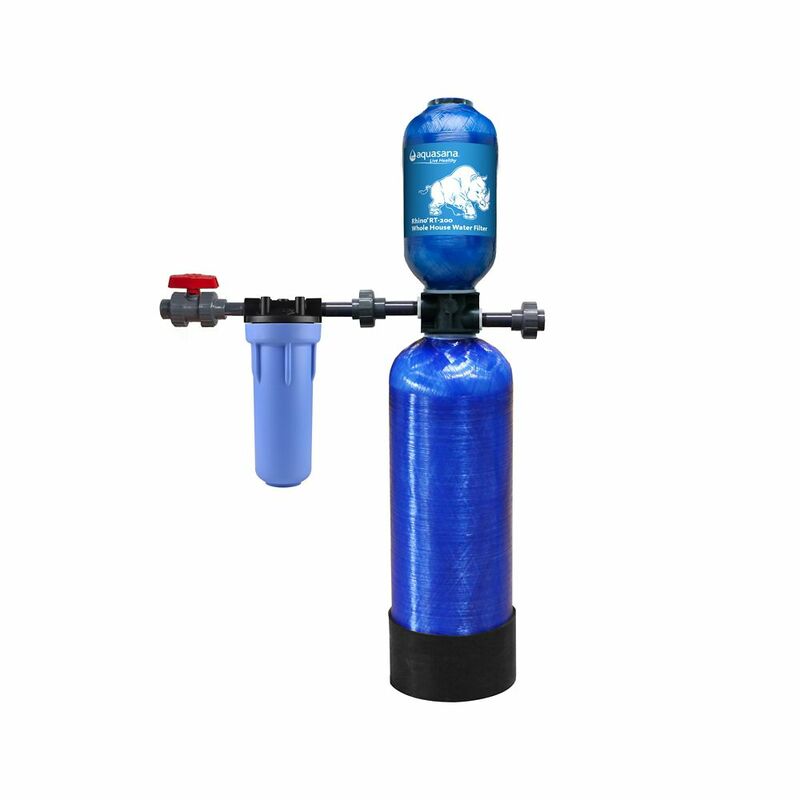 Whole House Water Filtration System This Aquasana Whole House Water Filtration System supplies clean, great-tasting water to every faucet in your home, cabin, townhouse or condominium without requiring electricity, drainage or back-flushing. Rated for up to 1,135,623L of treatment, the system is NSF-certified to remove over 97% of chlorine present in tap water in addition to reducing other harmful contaminants such as pesticides, herbicides, rust, sediment, water-soluble metals and industrial solvents. In addition to improving the purity of your drinking, bathing and laundry water, it also reduces the harmful impacts of contaminated tap water on appliances and plumbing fixtures. Whole House Water Filtration System is rated 5.0 out of 5 by 2. Rated 5 out of 5 by Peter from CLEAN water without chlorine! Really like this filter. This is a replacement to the first set I had for 5 years. Love that I can turn on the water anywhere in the house and get chlorine free water! Fairly easy to replace without using a plumber. Which part of this unit has the &quot;Stage 5 - the high performance UV filter kills bacteria and viruses commonly present in well water &quot; Also do you stock the changeable parts such as filters etc.? and at what price? ..Also do you install ? Does HomeDepot sell the replacement filters for the Aquasana?